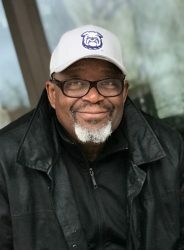 Wayne Ford, a longtime Iowa elected official and nonprofit leader, will receive an honorary Doctor of Humane Letters during Drake’s 144th Commencement Ceremony for Undergraduate Degree Recipients at 10 a.m. Sunday, May 20, in The Knapp Center. Ford, who earned a bachelor’s degree in education from Drake in 1974, has improved the lives of countless Iowans over a career that spans more than 40 years. Ford was an Iowa state representative from 1996 to 2010, representing House District 71 in Des Moines, a district that included Drake University. During his political career he introduced more than 1,400 bills and amendments, including influential first-in-the-nation legislation that requires lawmakers to draft minority impact statements before they can vote on new criminal justice legislation. Ford founded and served for 32 years as executive director of Urban Dreams, a nonprofit organization that advocates for improving life in poor and minority neighborhoods. 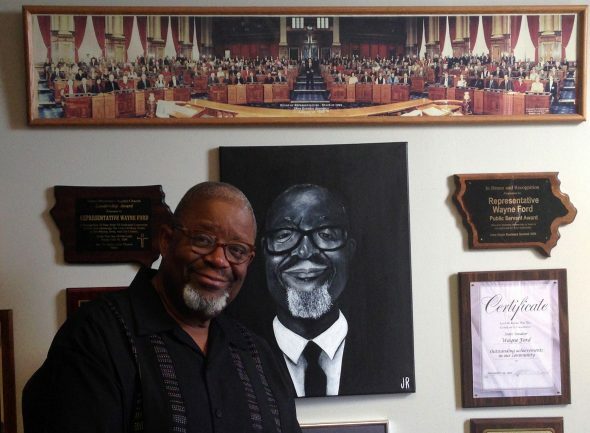 Wayne Ford poses in front of memorabilia from his time in the Iowa Legislature. He co-founded the Iowa Brown & Black Presidential Forum along with Latino community leader Mary Campos in 1984. The nation’s oldest presidential candidate forum dedicated to issues of concern to Latinos and African-Americans, the event has fostered discussion of communities that are historically underrepresented in the national political conversation. The most recent forum was held in 2016 at Drake University. In 1992, Ford began his own consulting firm, Wayne Ford & Associates (known since 2017 as Win For All), which works in the areas of nonprofit, public safety, and civic engagement. The firm also works with local and state governments, communities, and private institutions on equity issues. Ford’s dramatic rise from Washington, D.C.’s inner city to Iowa’s capitol has been chronicled in numerous publications, including The Des Moines Register, The Washington Post, The Source, and Parade. He was raised by his aunts in Washington, D.C.’s inner city before moving to Rochester, Minn., to play football at Rochester Junior College. He was recruited to Drake University on a football scholarship, and has proudly called himself a Bulldog ever since. His life story was included in award-winning journalist Dan Rather’s bestselling book, The American Dream. His numerous awards and honors include The Des Moines Register’s highest civic recognition, the Iowa Star Award, in 2009; and the Shining Star Award from the National Organization of Black Elected Legislative Women, an affiliate of the National Black Caucus of State Legislators, in 2008; and the NAACP Des Moines Branch’s Individual Community Service Recognition Award in 2016. Ford recently donated his historical papers and materials to Cowles Library, providing future generations of students, historians, and scholars a comprehensive picture of his decades-long career as a tireless advocate for equity and inclusion. He continues to serve the State of Iowa as a member of the Iowa Juvenile Justice Advisory Council, and he serves as chair of the council’s Disproportionate Minority Contact subcommittee. He is a visiting assistant professor of urban studies at Simpson College. Honorary degree recipients are selected by the Honorary Degree and Drake Medal Committee, and approved by Drake’s Faculty Senate and the Drake University Board of Trustees. More information about Drake University’s spring commencement ceremonies is available on the University website.